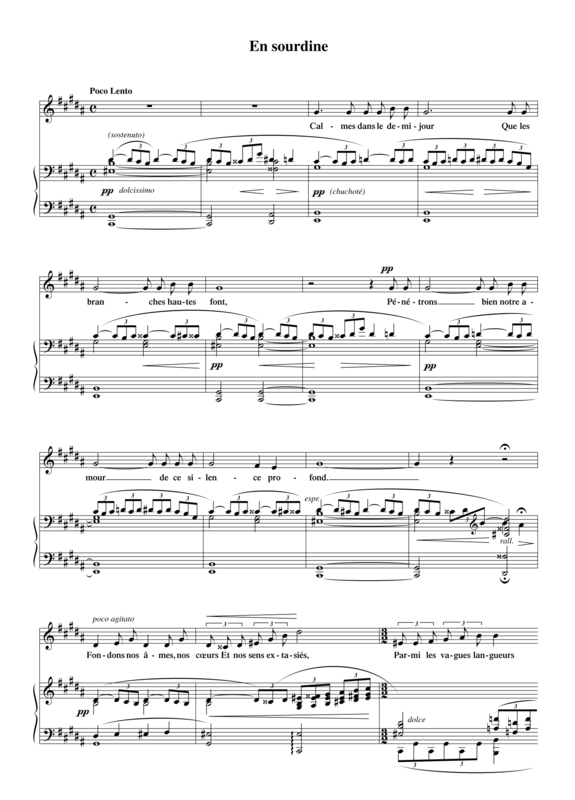 En sourdine (Muted) for mezzo-soprano and piano on a text by Paul Verlaine occupies a unique place in Diepenbrock’s oeuvre as it is a fairly strict copy of an existing model: the eponymous song by Debussy from 1891. Diepenbrock composed En sourdine in three days (21-23 May 1910) as a birthday present for his friend Johanna Jongkindt, who was a young, dynamic and exceptionally musical woman (she was a skilled pianist and often made copies of his compositions). Ever since the composer had changed his opinion of his French contemporary, they frequently talked and corresponded about the influence of Debussy’s music on Diepenbrock’s musical ideas. In July 1909 he admitted to Johanna that he considered Debussy’s first songs of his Fêtes galantes (Gallant Festivities) very beautiful and refined, although it is only touch and go , adding: But one cannot stick it out for very long with such weak music. (BD VI:128) In January 1910 Diepenbrock purchased the score of Pelléas et Mélisande for self-study. When attending the performance in Brussels of 1907 he felt, besides admiration for several passages, primarily dislike for its lack of melodiousness and the monotonous orchestral sound . (BD V:356) To ‘prove’ that he now understood and could apply Debussy’s stylistic accomplishments, Diepenbrock composed En sourdine, using the main ingredients of Debussy’s song. By setting this poem by Verlaine – an evocative sketch of the rapturous bliss of being together with one’s lover on an afternoon spent in a dreamy, tranquil sensuality and an attempt to maintain that joy when evening falls and the nightingale starts to sing – to music, Diepenbrock expressed his feelings for the woman with whom he was to start an affair two weeks later, while he was staying with her in Zeist from Friday 10 to Saturday 11 June. Diepenbrock expanded the half-diminished seventh chord e#-g#-b-d with which Debussy opened his composition, into a dominant ninth chord by adding a c-sharp under the chord which is repeated many times in the course of the piece. The two top notes are cornerstones of a melody in the piano that depicts the poem’s languid atmosphere with its small range and triplet movement. The voice recites the first lines of text quasi parlando on g# and b, accompanied by an E major triad to which the triplet melody adds in turn a major sixth and a minor and major seventh; this element forms a constant harmonic counterpart to the dominant ninth chord on c#. Diepenbrock’s vocal part continues to have the same simplicity that characterises Debussy’s melodies. But unlike the Frenchman, who right from the start evokes the song of the nightingale with a syncopated note repetition in a relatively high register, Diepenbrock saves this element for the musical setting of the last strophe. In his composition the birdsong does not appear until after the word “soir” (evening); at first timidly and shyly with four times a high b; after the following line a bit more explicitly with an added upward ‘whirl’, then (on the line after that) spun out longer, ascending from b2 to d#3 and accelerating with a quintuplet and finally culminating in a kind of ecstatic warbling. Diepenbrock concludes with an undulating triplet melody in the piano and a V-I cadence on F-sharp major. The dynamics of the song range from ppp to p. There is no indication how loud the crescendo of the upward line on “Fondons nos âmes, nos coeurs / Et nos sens extasiés” (Let our hearts, our souls blend / And our ecstatic senses, mm. 13-14), to be played poco agitato, should end, but the dolce that immediately follows suggests that the intended increase is small and is only to lead to a brief mf. This is the loudest dynamic mark that occurs in Debussy’s song, where it also lasts only half a measure. En sourdine is not only meant as a love song – to Johanna Diepenbrock referred to it as your song of the Nightingale (BD VIII:54) – but also as musical amusement. This stylistic copy, unique in his oeuvre, was so much connected with the intimate communication with his lover, that Diepenbrock never allowed the song to be performed in public; not even when the mezzo-soprano Ilona Durigo (1881-1943) showed an interest in it. (BD VII:280) Nevertheless, this does not affect the artistic merits of this miniature, the fifth and last song on a poem by Verlaine that Diepenbrock was to complete.